Hayley and Adam chose Sandhole Oak Barn for their August wedding. 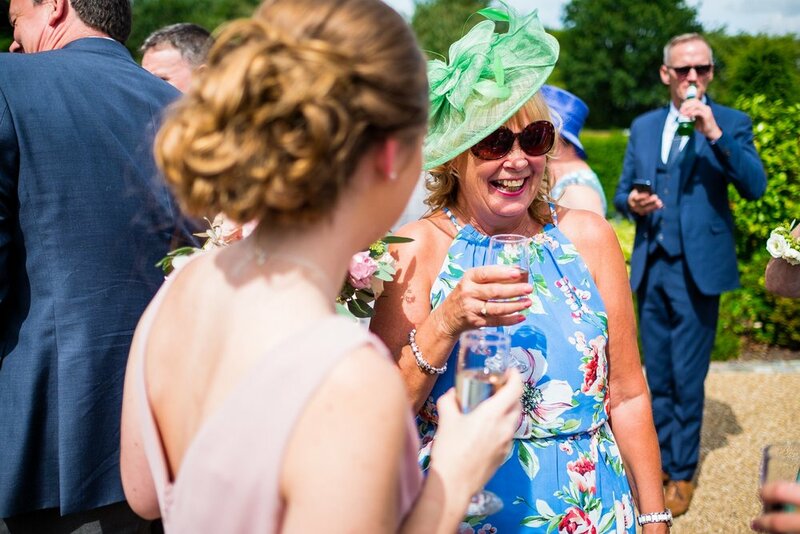 Situated in Congleton, Cheshire; Sandhole Oak Barn is an exclusive wedding venue in the Cheshire countryside, with stunning views and it’s very own lake, making it the perfect choice for any wedding. Hayley and Adam were both getting ready at the venue so I captured the bride to be while my second shooter Andy, captured the guys in their separate room. I arrived to find the girls in matching dressing gown’s, eating pastries, drinking champagne and having a great morning. I can tell everyone was in a good mood and that we had a great day ahead. During the morning a swallow managed to get into the bridal prep room, so I spent 10 minutes with a towel trying to capture it to everyone’s amusement. While I was chasing birds, Andy my second shooter, captured the guys getting ready quickly and then headed to the pub where they met some of the wedding guests and had a quick drink to calm any wedding nerves. 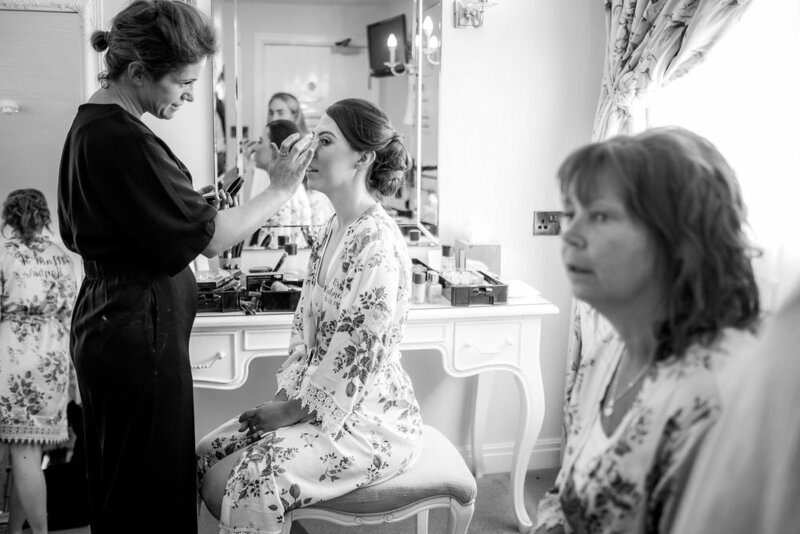 Meanwhile back at the venue I captured Hayley having her hair and make up done before she got into a stunning elegant dress which was sure to turn heads. 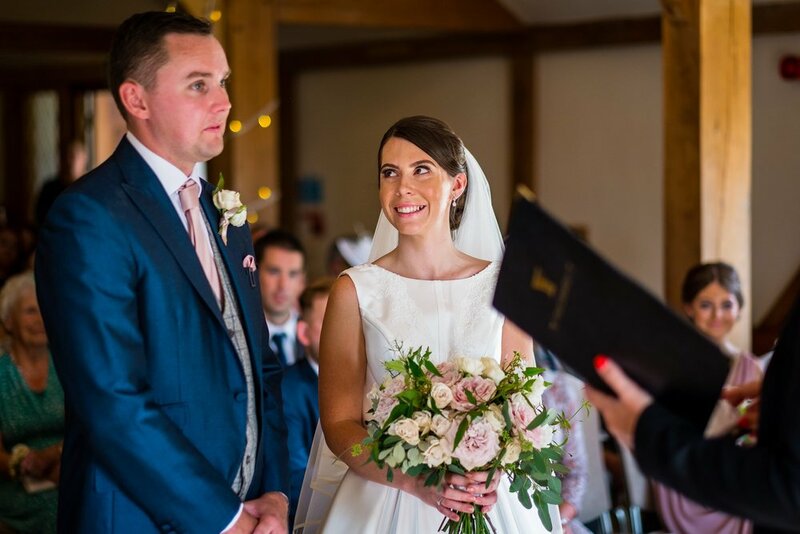 As Hayley walked down the aisle at Sandhole Oak Barn with her friends and family watching on, she couldn’t fight back the tears and neither could her groom or brother who walked her down the aisle proudly. The ceremony was full of emotions as they smiled from ear to ear as the exchange their wedding vows. One of Hayley‘s bridesmaids sang a song during the ceremony which once again had everyone in tears. As the newlyweds made their way back down the aisle, wedding guests through confetti and cheered them on. Everyone then headed outside for the drinks reception and to soak up the sun which was out in full swing. 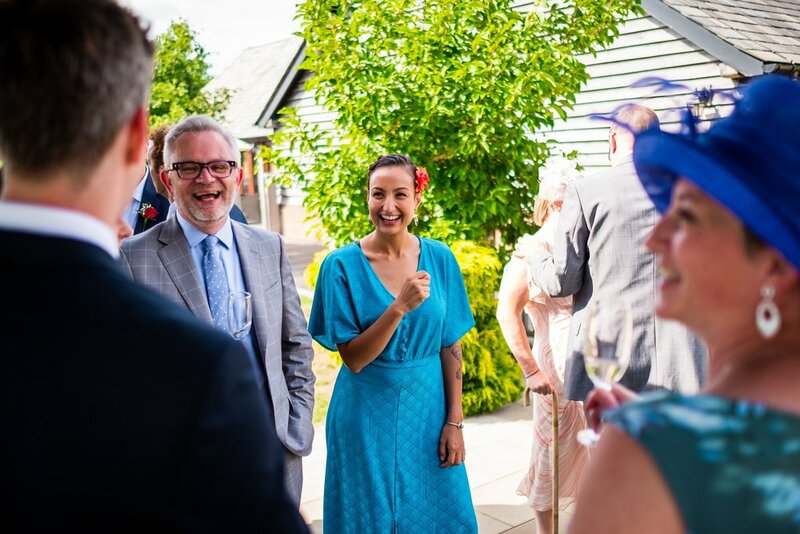 The drinks reception is the perfect time to capture some candid photos of the guests having a great time and it really tells the true story of the day. I stole the couple for a brief period to give them some time to themselves which allowed me to capture some natural portraits around the stunning venue. Sandhole Oak Barn gives you plenty of photo opportunities, as with every turn your met with stunning landscapes. It was soon time for the speeches and after the wedding ceremony, I knew these were going to be emotional. I don’t think there wasn’t a dry eye in the room as her brother delivered his speech. Of course it was then down to the best man to liven up the mood with some stories of the groom which had the room in fits of laughter. After the speeches guess were entertained by a game of Mr and Mrs which allowed me to capture some great reactions shots and got everyone ready for the evening. We were blessed with a lovely sunset over the Cheshire countryside so we made the most of the light and headed out for a second portrait session. As the speeches and formalities were done I can tell the couple had relaxed, which meant the photos turned out beautifully, as not only do they look amazing, but we were treated to some amazing light. As time ticked away it was soon time for the evening reception to begin. The night kicked off with the cutting of the cake before the bride and groom‘s first dance. As soon as this was done the party was well underway as guest grabbed props and made their way onto the dancefloor to dance well into the night. 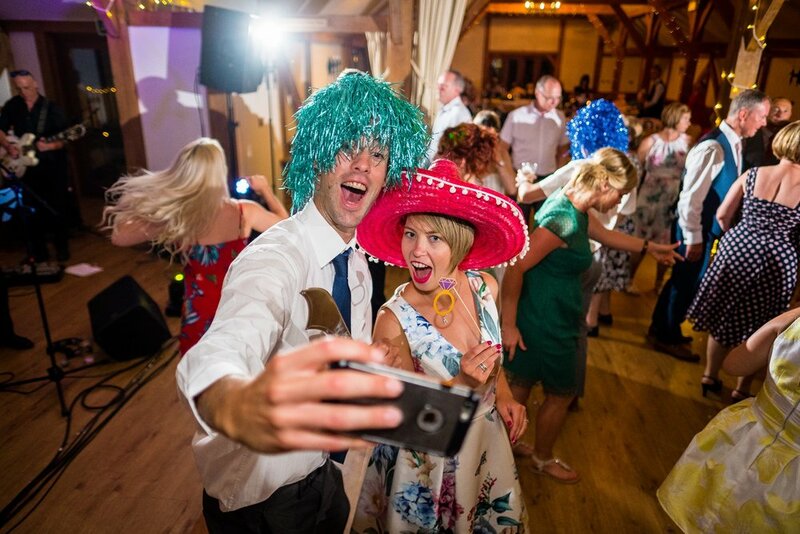 I captured some great moments on the dancefloor with the props and guests feeding each other wine. I love a wild evening reception, it always makes for some great photos to look back on. Once the dark had rolled in we ended the night with a sparkler sendoff at the front of the wedding venue. It was the perfect way to end a perfect day. If you all planning a wedding at Sandhole Oak Barn and are looking for a photographer to capture your wedding in a natural, unobtrusive way, then be sure to get in touch. 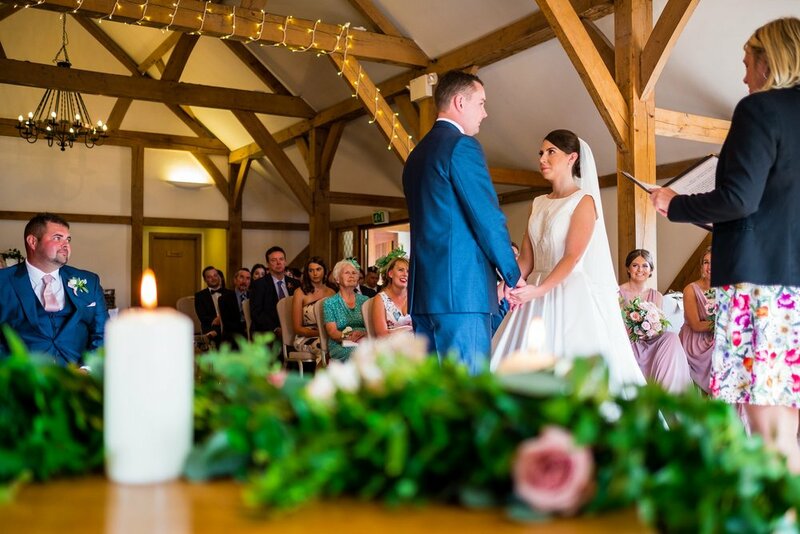 Sandhole Oak Barn is a wedding photographers dream from the lovely bridal rooms, the light reception room and the views around the venue making it lovely photo opportunities!